Charlotte was such a trooper during pre-op today. She cried during the blood draw. Mostly, I think she cries because she’s being restrained and she’s scared. She got over it super quickly. Then she basically held Daddy’s hand and ran to the x-ray department. We waited nearly an hour for the x-ray and Charlotte simply charmed the folks in the waiting area and colored. Oblivious and happy. Then hungry–she drank 3-4 ounces of Pediasure and ate two cookies!! Check out my bandaid. I’m so brave! Ooh. This is so cool. What is it? The lung x-ray looked like it would be a crying disaster. Then I decided to take a picture. She loves having her picture taken (big ham bone, she is). So we told her that the x-ray machine was a camera and she struck a pose worthy of Cindy Crawford. Seriously. The kid is a diva in training. No, we’re not space aliens. We’re all garbed up to avoid evil rays. Charlotte wore a lap pad. Hey, Julie! Can you believe I’ve quintupled in size since from my last surgery! And I like you! Kiss. Kiss. Charlotte is the second case which means we aim to get the hospital around 10 a.m. and they’ll take her to operating theater anytime after that. Could be a few hours wait depending on the surgery that precedes hers. They’ll administer anesthesia and insert the breathing tube and various IVs. Then they’ll open her chest. This is the potentially tricky and long part because it involves going through her original scar. The doctors will dissect and remove as much scar tissue as possible. Finally the procedures: First, arterioplasty. The doctors will open her right pulmonary artery by making a small incision and attaching a patch. In all, the surgery should take 4 to 6 hours provided there are no complications. Julie, of course, educated us about all of the risks. I’ll spare you the details. The most important thing is that if you have to be one of the 5-15 in 100,000 children born with Truncus Arteriosus, Type 1A (which is what Charlotte has) is the best iteration to have. She’s had no complications since she left the hospital on 6/28/2005. She’s thriving. And she’s at one of the best hospitals in the country for this surgery. 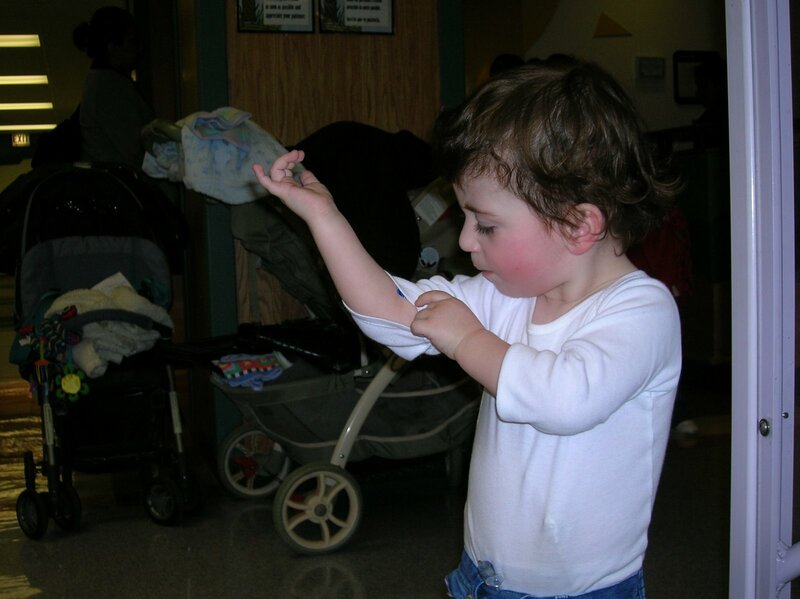 Categories: Children's Memorial Hospital, pediatric surgery, pre-op, Truncus Arteriosus Type 1 | Permalink.